Photoshop gradients are so much more than colors blending into each other -- they are an amazing tool that can help you create some quick and beautiful backgrounds. In this tutorial, I won't show you how you can create a gradient in Photoshop -- rather I'll suggest that you download many of the free and commercial gradient sets available on Photoshop related web sites. Some of the best gradient sets are available from Graphicxtras -- and we used their gradients in this tutorial. To use a third-party gradient set in Photoshop, you first need to load it. These instructions are for Photoshop CS but should work similarly for other recent versions. Place the gradient set (.GRD) file in any folder on your computer. In Photoshop select Edit | Preset Manager to open the Preset Manager dialog box. 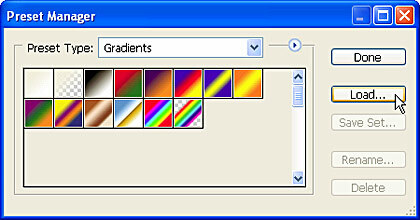 From the Preset Type dropdown box, select Gradients, and then click Load (see Figure 1). 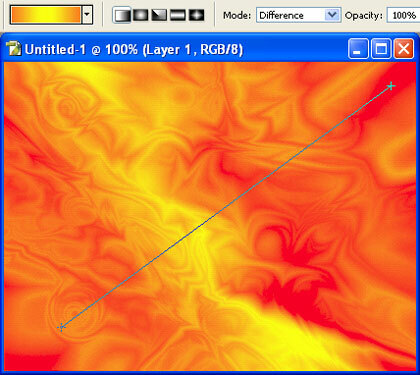 Navigate to and select the gradient file and click Load, the gradient will be added to the Preset Manager. After loading the gradient, click Done. Next time when the Gradient palette is opened, the new loaded gradient set can be found within the available gradients. Here's how you can create some great backgrounds using gradients by using the Difference blend mode. Create a new Photoshop image by choosing File | New, for this tutorial I have selected 1024 X 768 with a background content as Transparent. 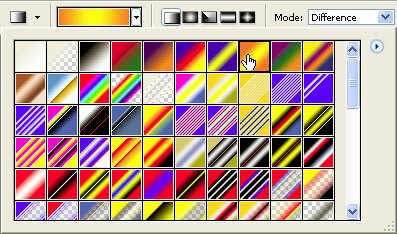 Select the Gradient tool in the toolbar, choose any gradient in the Property bar and set the blending mode to Difference, as you can see in Figure 2. Apply the gradient to the document by diagonally dragging it from one end to the other. Repeat the process continuously with the same gradient by dragging the cursor in different directions. Make sure that the option for Difference mode is unaltered. You'll end up with something similar to the result shown in Figure 3. Use different gradient colors and play around with different gradient styles to get some great effects.